Tips: Here is a concise user guide for you to find out the Firefox master password and get back your lost signon information using Firefox Maser Password Recovery 5.0, any inquiries about using the program, please refer to the "Help" document integrated in the program. Step 1: Select the type of attack. Step 2: Click "Start" button in the Menu to initiate the program. 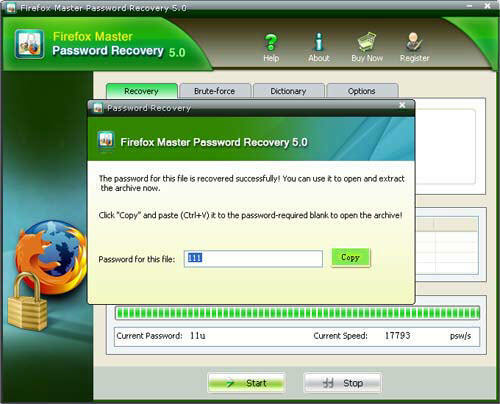 Step 3: The program is searching the password. 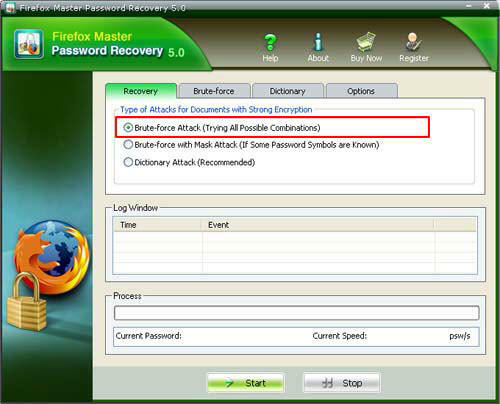 Some time later, a message box pops up to you, displaying the expected password. Sounds Good? Get " Firefox Master Password Recovery " Now!